There are some holiday events in Maple World these days. 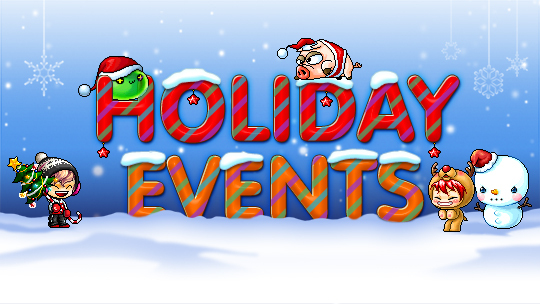 A bunch of joyous seasonal activities have been hosted by Maplestory site for our gamers to enjoy. Happyville is back! Visit this holiday-themed town by speaking to NPC Rooney in any major town. Once you arrive, speak to NPC Cliff to help him prepare for his fancy party! Collect Rascal Snowpiece items by hunting monsters within your level range (10 levels below and 20 levels above). Return them to Cliff and be rewarded with Cliff's Special Potion, an elixir that turns you into a pet or a monster and allows you to enter Santa's Shop. You can get to Santa's Shop by entering the house behind Cliff and going through the fireplace. Santa has stocked up on holiday-themed items including a Maplemas Party Potion, Gingerbread Cookies, and buffs! It’s time to decorate the tree! To begin, speak to NPC Cassandra and accept the quest '[Christmas] Decorate the Christmas Tree'. Hunt monsters within your level range (10 levels below and 20 levels above) to collect Christmas Decorations. Then use them to decorate the Christmas Tree located in each major town! Once you've got the tree all nice and shiny, you'll be able to receive V Coins, Gingerbread Cookies, or Christmas buffs. Dress up for the season with some festive outerwear! Talk to NPC Maple Administrator in the Event Hall and accept the '[Christmas] Christmas Everywhere' quest to receive a daily Christmas costume! Dress up as Rudolph, a Snowman, Santa, or Premium Santa! These costumes have a 1-day duration and grant +5 Charm when equipped. What are the holidays without gifts? Hunt monsters within your level range (10 levels below and 20 levels above) for the chance to obtain a Shining Santa Box. Open the box to find items such as V Coins, Rudolph’s Red Nose face accessory, winter buffs, Gingerbread Cookies, or a 7-day Santa Sled Mount coupon! Our gamers can visit Happyville, decorate a Christmas Tree, receive special gifts, and more. Click here for more holiday details. Enjoy the holidays!